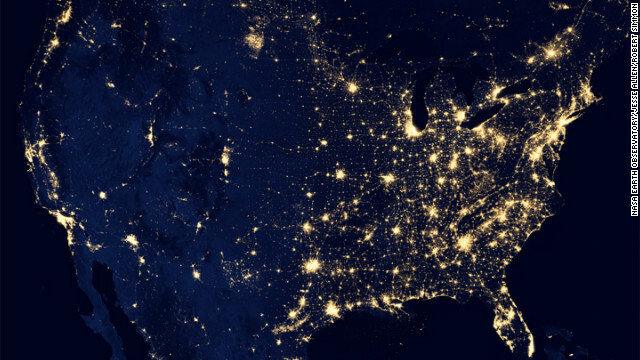 This composite image of the United States at night was made possible with the Visible Infrared Imaging Radiometer Suite. The Curiosity rover has been busily driving, scooping and analyzing material on the Red Planet, but there is lots more to be done on Mars. NASA has made plans for a new multiyear Mars exploration program, including the development of a new robotic science rover set to launch in 2020. The development and design of the next rover will be based on the same architecture as Curiosity, keeping costs down while delivering it to Mars in a way that has already been shown to work. NASA says the new mission is a significant step to ensure the United States maintains leadership in Red Planet exploration. The United States is determined to send Astronauts back to space sometime in the 2030s. Including this one, there are seven NASA missions either under way or being planned to study Mars. Observations from the European Southern Observatory's Very Large Telescope detected an unusual bright green galaxy that displays the largest and brightest glowing regions ever seen in the universe. “They are so huge and bright that they can be observed in great detail, despite their large distances,” according to a statement from the European Southern Observatory. Researchers found 16 more galaxies with similar properties and gave the group of galaxies a new name based on their unusual appearance. “This new class of galaxies has been nicknamed Green Bean galaxies because of their color and because they are superficially similar to, but larger than, green pea galaxies,” the statement added. A NASA and NOAA satellite called Suomi National Polar-orbiting Partnership has revealed high-resolution images of our planet at night. Data from the new images shows light from natural and man-made objects on the globe in unprecedented detail. That's thanks to a sensor called the Visible Infrared Imaging Radiometer Suite, or VIIRS. “Satellites in the U.S defense Meteorological Satellite program have been making observations with low-light sensors for 40 years, but the VIIRS day-night band can detect and resolve Earth’s night lights,” a NASA statement explained. NOAA Weather Service’s forecast office in California uses VIIRS day-night band to improve monitoring and forecasting of dense fog and low clouds at high air traffic coastal airports such as San Francisco airport.